The Theory of Loss Aversion : why do we hate to lose? It really cracks me up how people don’t back out during an argument. We always have to win. We Google data to back up our assertions. We mudsling and resort to name calling. We can’t lose. We have to be right all the time. I am not always right. I know that. But it’s still hard to accept that I lost to someone sometimes, even to my husband. It’s not the winning but the the losing. Look at the threads on the forums, articles or even on Facebook where any monkey with a keyboard can assert his Very Important Opinion. It seems like everyone thinks he’s right and is out to convince the whole world that his opinion is far superior than the others’. Studies have been done about this. I found some references from a book called Cheap, the High Cost of Discount Culture by Ellen Ruppell Shell. There must be a logical reason people go crazy over discounts, right? Or what about driving to Costco for 2 hours on a weekend? Or what being unable to turn away from discounts? I pride myself for being well-read and well-informed, yet I cannot resist a good bargain. Here is the study done on people. Please answer as honestly as you can. For both situations 1 and 2, which would you have rather have ? Choice A: You have a 50% chance of losing $1,000, and 50% of losing $0. Unsurprisingly, the overwhelming majority chose “B” and “A” respectively. I bet you did too. If the subjects had answered logically, they would pick either “A” or “B” in both situations. (People choosing “B” would be more risk adverse than those choosing “A”). However, the results of this study showed that an overwhelming majority of people chose “B” for question 1 and “A” for question 2. The implication is that people are willing to settle for a reasonable level of gains (even if they have a reasonable chance of earning more), but are willing to engage in risk-seeking behaviors where they can limit their losses. In other words, losses are weighted more heavily than an equivalent amount of gains. Which one do you think is a better motivator for workers to work harder? Objectively these are two ways of describing the same scheme. But under a theory of loss aversion, the second way of presenting the bonus should work better. Workers would think of the provisional bonus as theirs, and work harder to prevent it from being taken away. This is just what the economists found. The fear of loss was a better motivator than the prospect of gain (which worked too, but less well). And the difference persisted over time: the results were not simply a consequence of workers’ misunderstanding of the system. Economists have always been advocates of using carrots and sticks. But they may not have emphasised appearances enough. Carrots, this research suggests, may work better if they can somehow be made to look like sticks. This explains why *I* can’t resist a bargain. It’s now how much I spend, it’s how I perceive I am saving when doing my purchases. When we shop and we see the price “slashed” into half or a quarter of its original price, we are “lead” to believe we are avoiding losses – never mind that it is probably just an illusion, a strategy for shops to encourage people to buy. For all we know, the slashed price may just be the “original” price. As illustration of this, Kahneman and Tversky evoked the universal phenomenon of loss aversion, the tendency of most people to strongly prefer avoiding losses rather gains. At first blush this sounds counterintuitive. Doesn’t everyone want to win? The answer, of course, is yes, but not as much as we don’t want to lose. If you don’t play, you can’t win, but also can’t lose。And that’s the reason so many of us decline to play when we should. Not playing results in lost opportunities, but scientists have shown that humans are not wired to spontaneously factor in missed opportunities, particularly, when those opportunities are projected far into the future. We are wired, however, to worry a good deal about losing. And when it comes to feelings of loss, it is not necessarily the actual loss but the perception of loss that keeps us from acting in what would seem to be a rational manner. Shell, Ellen Ruppel. Cheap, the High Cost of Discount Culture. Does it go the same way for arguments? Is it why people stick to their original statements, although proven wrong ? 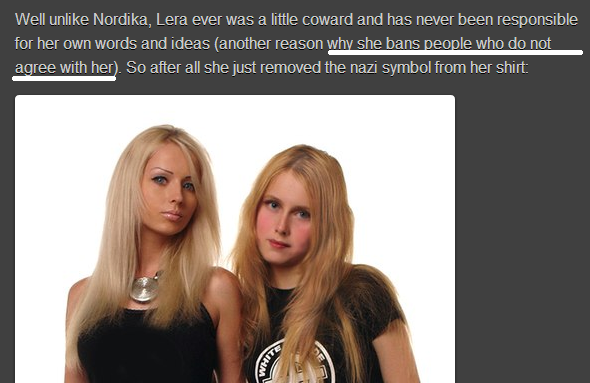 Is it why people just refuse to retract the stupidest thing they said? How many times have we actually seen someone admit he (or she) was wrong? It’s not only about being wrong, but having someone think you are wrong. Perceptions are not necessarily real- but they are our reality. But if you instruct me again to stop bashing this man I am unfriending you. I will unfriend you in Facebook, on Twitter, on Instagram, and out in our leaderless streets. Here is a graph showing our joy and pain with regards to losing and winning. Consequently, when multiple gain/loss events happen, each event is valued separately and then combined to create a cumulative feeling. 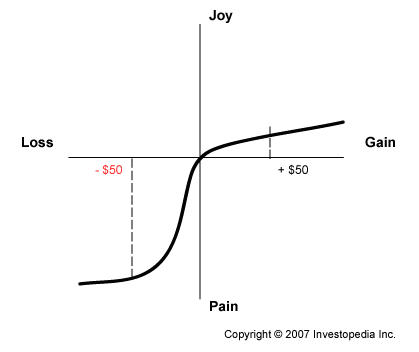 For example, according to the value function, if you find $50, but then lose it soon after, this would cause an overall effect of -40 units of utility (finding the $50 causes +10 points of utility (joy), but losing the $50 causes -50 points of utility (pain). To most of us, this makes sense: it is a fair bet that you’d be kicking yourself over losing the $50 that you just found. Once upon a time, I was in love with Venice. I took the train from Perugia (where a lot of my relatives live) back to Sta Lucia in Venice. The train conductor, for some reasons, didn’t have change (or so he claimed) for my train fare and told me to come back for the 5 euros. It was evening and I was staying on another island, called Murano, around 20 minutes from the Sta Lucia train station by boat. That time, the one way fare for the vaporretto was 3 Euros unless you have a day pass for 9 Euros. The next day, I asked a friend, a local of Murano, to take me back to Sta Lucia to claim my change- in my head, I was converting 5 euros to Pesos. Surely, it was worth the trouble, right? My friend asked me how much the conductor owed me and he burst out laughing when I said 5 euros. He said simply, “We’re not going back for 5 Euros! It’s a cup of coffee! I’ll pay for your coffee, come!” I felt like I have just been had. 5 Euros!! It was probably the conductor’s strategy, to cheat tourists. The coffee was great-but not losing my 5 euros would have made me feel much better. No wonder I still act irrationally angry when I am being shortchanged by cab drivers back home- even for pennies we can’t buy anything with. Now it makes sense. I mean, don’t you get irritated (at least temporarily) when you find out someone has “unfriended” or “banned” you? (Probably the reason why we don’t get “notified” for our losses on FB?) And the “joy” of having someone else add you doesn’t compare to the degree of this irritation. It is probably the very same reason why people cling to joyless relationships or dead-end jobs. Because we hate losing. This aversion to losses is the reason why people behave irrationally. A good bargain is probably not a very good bargain- not if you’re not going to use it anyway. Not if you don’t need it. Not if it breaks after taking it out of the packaging. And it’s probably not worth trying to stand your ground when you’ve obviously been proven wrong and risk losing a friend. I hope you, reader, uses this information , not only in your shopping habits but in your everyday life. Interesting article. I chose “B” on both, but because I multiplied all the amounts by 10 to amplify the impacts. At $1,000 or $2,000 I would just skip the game. “Pocket change”. ahahahaha The point being responses might also be related to means. I detest being cheated but don’t mind losing an intellectual debate. One seems to be a challenge to character, the other to knowledge, and I long ago recognized I have very little of all the knowledge that is out there and held by others. Now, being ok with losing to an intellectual debate is a sign of maturity, I think.. It’s admitting what you’ve previously thought of as “wrong”..which is unacceptable, say, for religious people to accept.. So I guess, aside from maturity, one also needs to be “open”. Unfortunately, while there are many folks back home who may be mature, there are certain topics they are very “closed” about, topics that are non-negotiable, and that when debated about, it would be unthinkable to lose.. I can say, you belong to a rare group. And you, too . . . This entry was posted on April 21, 2014 by ikalwewe in For real?, people and friends, thoughts, Thoughts - Philippines and tagged attitudes, aversion, bargain, discounts, economist, gains, joy, Kahneman, larger, loom, loss, losses, pain, shopping, than, tversky.